Ronstan Ratchet Orbit Blocks™ have the highest holding power available. The sophisticated NC-machined sheave features Generation 2 of our patented sheave cross-hole geometry. Its holding power is up to 20:1, double that of our nearest competitor. The unique sheave design has 12 gripping faces which directly resist loaded line movement. Traditional designs have only 8 faces with an angled resistance to line movement. Our Generation 2 design has straight resistance faces which both distribute the load and minimize rope wear. These faces are offset from the radial line, to draw the rope down into the gripping area when under load. Kilogram for kilogram of working load, BB and RT Orbit Blocks™ are the world’s lightest. To gain peak performance, we engineered out the heavy steel load straps, head post, shackle, full-length fasteners, and cleating accessories. Through extensive research and development, we replaced virtually all metal components with high-tech polymers and fiber equivalents. 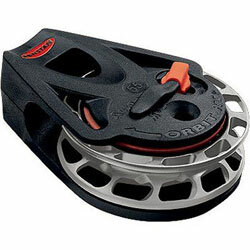 The unique orbital design allows the bearing to only be in the active areas of the floating sheave. This minimizes the mass of the inactive return race and hub. The floating sheave and bearing system is supported by a fiber-reinforced load frame. The design was computer modeled to be stress optimized. The Dyneema® Link is produced from FSE Robline SK75 fiber, which is 10 times stronger and lighter than steel, and provides the final connection from the block to the load point. The Dyneema® Link is easily fitted and is retained securely by a molded retainer clip. The flexible link can be left with one end attached to the block when fitting - no more lost shackle pins. The system is compatible with Dyneema®/Spectra® strops, webbing and carbon connection points - much more so than steel loop tops or shackles. The flexible Dyneema® Link provides controlled rotation and 0° or 90° orientation. It connects directly to the head of the block rather than to an intermediate head post. This reduces weight and gives the lowest possible profile while allowing full articulation. Beckets have been carefully designed to minimize height.